This is an amazing tool. I love that it can vacuum and mop all in one step. I like that it steam cleans without using chemicals and it does a great job sucking up my pet hair. It is a little tricky to use if you only want to vacuum because the steam mop button is right where you hold onto the handle, but it is easy enough to work around. Effortlessly clean your home with the Bissell Symphony Pet All-in-One Vacuum and Steam Mop. It allows you to vacuum pet hair and debris while steaming your hard floors at the same time. Completely chemical free, this device uses water making it extremely pet friendly. Switch seamlessly between functions while cleaning with the Easy Touch Digital Controls so you can vacuum and steam at the same or separately based on your cleaning needs. Improved powerful suction for better pet hair pick up. Washable mop pads let you tackle your everyday messes over and over. Naturally sanitize your floors with only water, no chemicals. This product exceeded my expectations in so many ways!!! I was skeptical that it would really clean well, especially while vacuuming at the same time; boy was I wrong! I have textured wood floors that are coated with a special finish - I can’t use most products for wood floors on them because of the wax in them dulling the metalic finish. This steam mp not only cleaned them amazingly, it also cut my time in half by vacuuming up dog hair, dirt, general house mess ahead of the steam clean. Amazing! 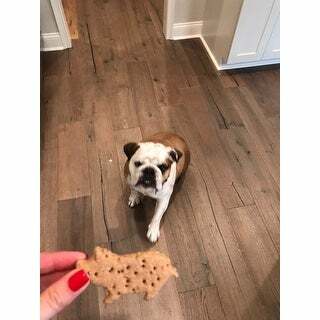 I have a bulldog and he leaves delightful water drip paths from his water bowls or drool during treat time around the house - the steam mop cleaned those right up! Kitchen grime by the stove? They’re no problem for this wonderful machine! Marble floors - large 18” pieces and tiny 2” shower details - in my bathrooms are now sparkling clean! I could go on and on - I literally love cleaning again :) And it’s very quiet, another great surprise about this product. Some photos of the aurfaces this vacuum/mop dominated - there’s no surface it can’t handle! I can’t believe I didn’t buy one of these years ago! We have 7 cats, 2 dogs, and 3 exotic birds. You can just imagine the dander and hair we clean up on a regular basis. I had reservations about buying this as most vacuum/mop combos don’t have very strong suction and really leave more of a mess than they clean. NOT THIS ONE! It has strong suction for even dog kibble and the steam mop is absolutely fantastic. Even tough, stubborn, and sticky messes are no challenge to clean. I’d definitely buy this again and highly recommend it to anyone looking for a faster, more hygienic way to clean! I LOVE my Bissell Vacuum/Steam Mop. Sweeping &amp; Mopping my kitchen and livingroom floors were killing my back. But with the steam mop I don't have to scrub my floors with the mop. Cleaning my floors has never been so much fun! We love this vacuum. We have to pets and it picks up pets hair easily. It cleans and vacuums the floors great, I would recommend this vacuum. This is so easy to use. I have tile floors. I can vaccum and mop all at one time. It works great. The steam mop cleans as well as me moping. I have 3 dogs. This is such a huge time saver. 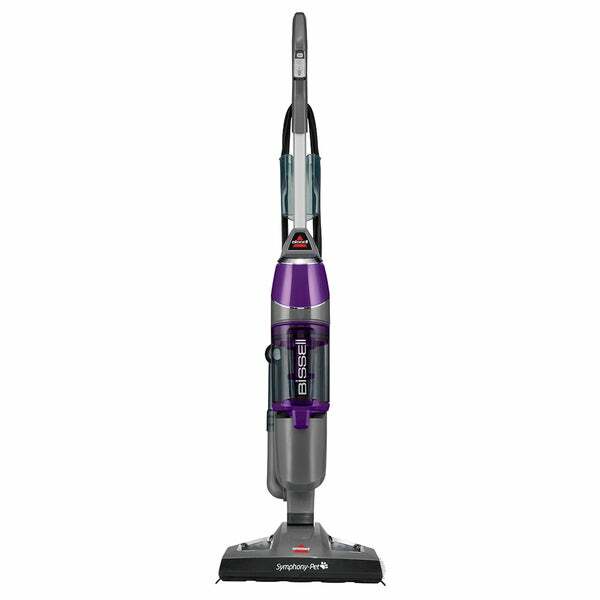 This Bissell 1543 Symphony Pet All-in-One Vacuum and Steam Mop worked incredible! To be able to vacuum right before the steam mop, is genius. I never had any issues with this product and I highly recommend it! I have two large dogs and all white tile floors in my house. This steam mop was able to keep my floors white and beautiful. My dogs weren't even afraid of this mop. I recommend you buy this if you have dogs! Didn't even know this thing existed and I'm so glad I found it. We have several parrots and really needed to find something bird friendly to clean the tile flooring. Not only does this little machine have awesome suction power, but the steam mop feature works great, too! Highly recommend to other bird / pet owners to clean your floors without all the chemicals! Lightweight and nice. Allows me to steam my floor but pick up dog hair at the same time. This is the most amazing vacuum I have ever owned. I have ceramic tile throughout my house and being able to vacuum, instead of sweep, and mop at the same time is a dream come true. It is so light and easy to use and cleans the floor amazingly well that I don't even mind cleaning the floor anymore. It's not extremely loud so it doesn't bother my animals and is great for just quick spot cleaning too. I have recommended it to all my friends. I just wish the cord was longer! It recommends scent pads to put in it but I put a little Mr Clean with Gain in it and it makes the house smell terrific. This is an awesome piece of machine. We have wood tile and it makes cleaning our home so easy! It’s light and easy to use. We absolutely love it! This has been a lifesaver with our wood floors. So much easier than sweeping. Easy to use and empty. Great for cat hair and hardwood floors. This combinations vac and steam beats vacuuming and mopping. Light weight and easy to use on my hardwoods and tile floors. Cleans well. Really glad I purchased this item and at a better price then other stores. This product is amazing! I have four dogs and massive amounts of tile throughout our home. Why not kill two birds with one stone?? This all in one vacuum steamer makes life so much easier in such a short amount of time! It does Vacuum and steam mops at the same time. So Easy to set up and use. Did a great job doing both! Saved so much time. I love it. Worth every penny. Loved this vacuum, my only advice is you absolutely need to use distilled water, or else it will break! I unfortunately did not know that the first time around and ended up buying this one after about a year of having the first. I really like this. It's so easy to use, just wish I had gotten the one that you can add a cleaning solvent to. But, the steam is great, and the fact that you can use the vacuum as you steam the floor is great. Picks up all the little bits on the floor, and dog hair, too. We have three cats, a dog, two small kids and a house full of Pergo laminate wood flooring. This vacuum and steam mop makes cleaning the floors a breeze, for big and small messes. It is lightweight and easy to use. I would highly recommend this product! I absolutely love this vacuum and steam mop. The steam feature sanitizes my floor and vacuum at the same time. This product is amazing, cut down my chose time in a big way and is safe for the pets and family. Gave four stars because it hasn’t been too long and it seems to have lost its ability to get as warm as it once did. "How easy is it to purchase additional cleaning pads?" "Can you vacuum carpet with this cleaner?" 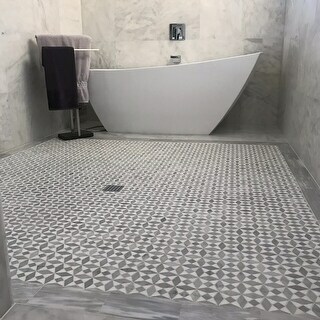 Designed for bare and hard floors.